Seeing my own country’s flag: the Stars and Stripes, Old Glory, the Star Spangled Banner – the American flag- always fills me with a sort of quiet pride, knowing the history of our nation. Knowing, academically in many cases, the many men and women that fought the world over to keep that flag flying. The more famous photographs and paintings – the original Old Glory, waving o’er Ft. McHenry, black-and-flag draped coffin of Abraham Lincoln, the raising of the flag at Iwo Jima, on the moon, at the rubble of the World Trade Center. Heck, even on the cover of Springsteen’s “Born in the USA” album. Fighting for independence, one country breaking ties from another, is oft seen as an American venture. Far from it. Today, that notion of sovereignty is as important as it was in 1776. 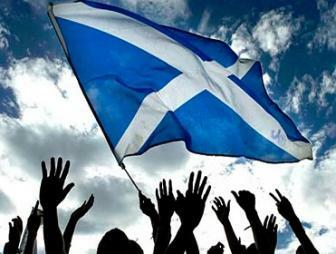 Today, Scotland is voting on a referendum that will tie or sever its 307-year union with Great Britain. 2014 less 307 is 1707. Those who have watched “Braveheart” know the the part William Wallace, the Highland laird who first led resistance to English rule in the 1300s after the original Royal Scottish line died out. After some success, he was captured, hanged, drawn, and quartered. In 1306, after Wallace’s death, the throne was taken by the eighth Robert the Bruce (Generally just known as “Robert the Bruce”). England met Bruce with no mercy and the two countries fought a series of battles which culminated in 1314 when the troops of Edward II were crushed. In 1320, a letter, written in Latin and addressed to the Pope, was sent to declare Scotland’s independence as a sovereign state and confirm its right to defend itself when unjustly attacked. …as long as but a hundred of us remain alive, never will we on any conditions be brought under English rule. It is in truth not for glory, nor riches, nor honours that we are fighting, but for freedom – for that alone, which no honest man gives up but with life itself. Sound a bit familiar? The American Declaration of Independence wasn’t written, of course, until 1776. This, the Declaration of Arbroath, was written in 1325. In 1328, England renounced overlordship Scotland and confirmed Robert the Bruce as King. Things were tentatively okay with Scotland’s southern neighbors until the death of James IV at the Battle of Flodden. His granddaughter, Mary, Queen of Scots, was sent to be reared in France with her mother’s family (Mary was twice-royal; her mother was Marie de Guise.) Problems arose when she became of age and returned to Scotland – a 15 year old Catholic girl suddenly had the Protestant Reformation on her hands. That very schism of religions, Catholic Mary in the north and Protestant Elizabeth I in the south had the British Islands in an uproar. Elizabeth, seeing her cousin Mary as her rival, had her imprisoned in the Tower and as plots swirled on both sides, Mary was executed in 1586. Elizabeth died in 1607, and the crown went by default to Mary’s son, King James VI of Scotland, who was now also James I of England, thus uniting the two crowns after centuries of just-barely contained hostilities. A century later in 1707, Acts of Union formally joined Scotland to Great Britain. This came after a brief period of upheaval between the parliaments of Scotland and England. Following this, James II of Scotland was exiled, and the nations were linked. This did not stop periodic revolutions such as the one in 1715, an ill-gained attempted at regaining Scottish independence, nor the famed ’45, with James II son, Charles, (“Bonnie Prince Charlie”), which although saw initial strong success, ended in slaughter on Culloden Field. So angered were the English troops that for years they ravaged the Highlands, killing and imprisoning. Famine struck the land, and many chose to leave their homes for new lives in France or the colonies. Despite atrocities against Scottish culture in the years that followed including the Diskilting Act of 1746 which made ownership of arms and the wearing of Highland dress illegal, the Scots have never given up on hopes of one day regaining national sovereignty. In 1934, the Scottish National Party (SNP) was formed and made an Independent Scotland its primary goal. 1997 saw a referendum that kept Scotland part of the United Kingdom, but gave it control over its own education, health care, and finally, a Parliament. Seven years ago, the SNP won a brilliant upset against the incumbant Labour Party. This exchange in party power led to the vote we are seeing today. It is this writer’s opinion that despite the official documentation, Scotland’s independence died with the Stuart cause on Drumossie moor that cold, raining, awful April morning in 1746. The spirit of Scotland never did.